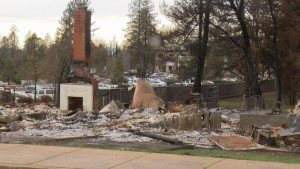 BUTTE COUNTY, Calif. (NBC News) – More than 100 residents of Paradise, California been ordered off of their properties left in ruin by the Camp wildfire. On Monday the Paradise Town Council voted to rescind an ordinance allowing residents who lost their homes in the fire to live temporarily in trailers or RVs on their burned properties. Some residents had purchased RV trailers after the town had given them the go-ahead to return in December. Town leaders blame the Federal Emergency Management Agency, which now says it won’t reimburse the state some $1.7 billion dollars if the burned parcels are deemed safe for habitation. The Paradise Town Council voted to evict those residents, despite emotional and angry protests. “It’s a no-win situation. I agree with everything that everybody is saying. Like I said, we can’t afford to play chicken with FEMA,” town council member Steve Crowder said after the vote.